Filled with clear, concise, and practical information based on the latest research, The Manual That Should Have Come With Your Body tells you everything you need to know to keep your body running in peak condition and to get as much mileage out of it as possible. Basic Operating Instructions simplify everything from eating right and fitting fitness into a busy life, to putting the breaks on stress and getting a good night's sleep. Important Safety Precautions explain how to reduce your risk of illness and injury, and a Preventative Maintenance Schedule provides guidelines on when to see your health care professionals for routine service. You only have one body and it must last you a lifetime. You can't trade it in if it breaks down and replacement parts are very hard to come by. 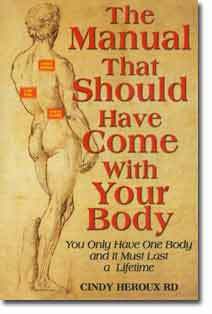 To feel great, look your best, and live the longest, healthiest life possible, The Manual That Should Have Come With Your Body is the one book you must have! please email or call us at (407) 928-4750 . ?2004 Speaking of Wellness, All rights reserved.